Exfoliating Scrub cream for the face, recommended for oily skin and YOUNG skin prone to acne. Containing microballs and of AHA (acid of fruits), with keratoregulating action, allowing to eliminate the dead cells and to scale the surface impurities carefully, to control sebaceous secretions, to balance the cutaneous flora and to prevent the phenomena of irritations. Clear and purified, the skin finds a feeling of freshness and comfort. Without soap. Hypoallergenic. Non-comedogen. 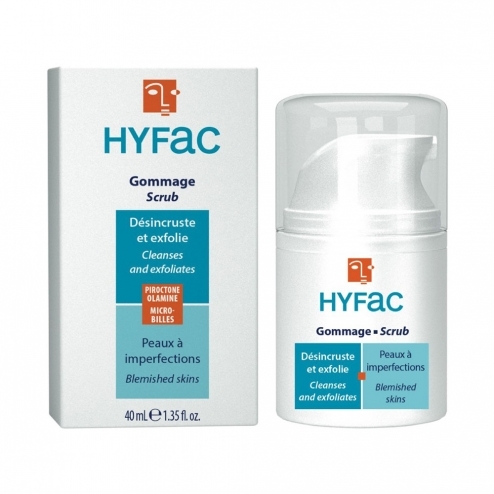 USE: Hygiene and care quick exfoliant adapted to the oily skin and YOUNG skin with acne tendancy. HOW Of USE: Frequency of use: 2 times per week. - Apply a hazel nut of cream, to the slightly wet skin of the face and the neck. Delicately Massage by circular motions, while insisting on the concerned zones (nose, face, chin). - To rinse abundantly with tepid water. Ingredients: Water, C12-13 alkyl malate, cetearyl octanoate, polyethylene, glycerin, steareth-21, steareth-2, cetyl alcohol, phenoxyethanol, xanthan gum, C13-14 isoparaffin, piroctone olamine, methylparaben, fragance, laureth-7, propylparaben, citric acid.